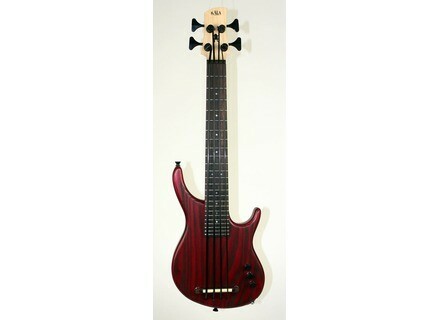 KA-SB4FS-S, 4-string bass guitar from Kala. Kala's Solid Body U-Bass is a solid body design described as the next step in the evolution of Kala’s line of 21 inch scale bass instruments equipped with Kala’s polyurethane strings. The new basses are being manufactured in California and assembled in Kala’s custom shop. Kala Solid Body U-Basses are available in four and five string models, and with the option of a fretted or fretless fingerboard. There are four color options that include Translucent Satin Black, Skyline Red, Espresso, and Natural Ash. Other specifications include Custom Hipshot Tuners, Mi Si Align Active Preamp system with battery free technology, volume control and 2 band EQ and a Graph Tech Black TUSQ nut. A deluxe logo gig bag with plush padding and hidden backpack straps is included with each bass. Visit www.ubass.com for more details. [Musikmesse] Gibson Les Paul Standard Bass Oversized The Les Paul Standard Bass from Gibson USA takes the Les Paul styling and the classic design and construction— and applies them to the low end—with an "oversized" Les Paul body. [Musikmesse] Warwick Steve Bailey Signature Bass Six string and fretless, the new Steve Bailey Signature Bass features bolt-on construction and a 34-inch scale length. [Musikmesse] Squier Matt Freeman P Bass Squier introduces the Matt Freeman P Bass, the signature model for Rancid's and Operation Ivy's bassist.